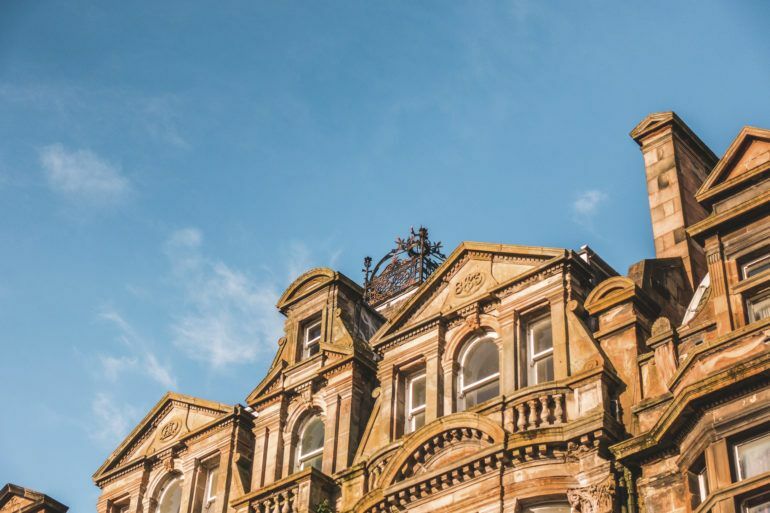 Iconic buildings adorn the town’s skyline, an enduring legacy of the town’s time at the centre of the global textile trade and the civic altruism of the textile magnates. 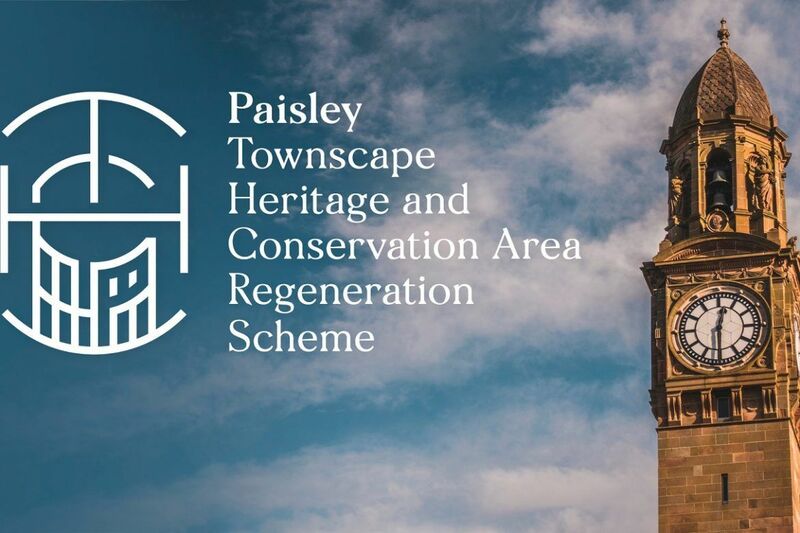 A number of Paisley architects were engaged in its redevelopment and expansion, and gave Paisley its enduring, self-confident and prosperous character. Thomas Coats Memorial Church by Hippolyte Blanc of Edinburgh, 1894. However, it was chiefly local architects who were engaged in the redevelopment and expansion of the town, and give it the solid, self-confident, and prosperous character which is still evident today. They included James J Lamb (1817-72), JA Rennison (1841-1915), Charles Davidson (1841-1924), Peter Cardwell (active 1886-1914), James Craig Barr (1876-1944) and Harry Cook (1880-1954). The most prolific Paisley architects were James Donald and TG Abercrombie, with whom JC Barr and H Cook trained. John Hutchison (1841-1908) was a Paisley man who practised in Glasgow, but designed several large villas around the town. He is chiefly remembered for having Charles Rennie Mackintosh as an apprentice. Paisley’s most famous architectural son was Thomas Tait (1892-1952). He trained under James Donald, but went on to design buildings around the globe, including the pylons of Sydney Harbour Bridge. In Scotland he is remembered for St Andrew’s House in Edinburgh and Tait’s Tower at the 1938 Empire Exhibition in Glasgow. His main work in Paisley is Hawkhead Hospital (1932-35). Four architects stand out for the number and quality of buildings they designed for the town between 1880 and 1940. Our architectural trail map is your guide to these four men and the remarkable buildings they created. The son of a Paisley farmer, James Donald worked at an early age for the great Glasgow architect Alexander ‘Greek’ Thomson (1817-1875) before setting up his own practice in Paisley in 1881. Donald’s first major commission was the Liberal Club in 1886. Active in the Liberal Party, he was also in a good position to get the commission for Dunn Square from the town’s Liberal MP, Sir William Dunn, and for as many as 87 tenements along new widened streets. The best of these have memorable corner towers, with wide arched ground floor windows to public houses, shallow bay windows, sometimes divided by heavy stone mullions, and transoms. He also designed numerous villas in Paisley’s suburbs. (altered 1901 by Peter Caldwell) Greek-Thompson-like superimposition of arcaded ballroom over heavier first floor façade. Free perpendicular Gothic (copper rocket roof to truncated spire by Page and 1993). Formal Italianate setting for statues, complementing the town hall opposite and the connecting bridge. Wrought iron railing as along the river enclosed also south and west side until WW1. TG, as he was known locally, set up Paisley’s most prolific and long lived architectural practice in 1886 at the age of 24. 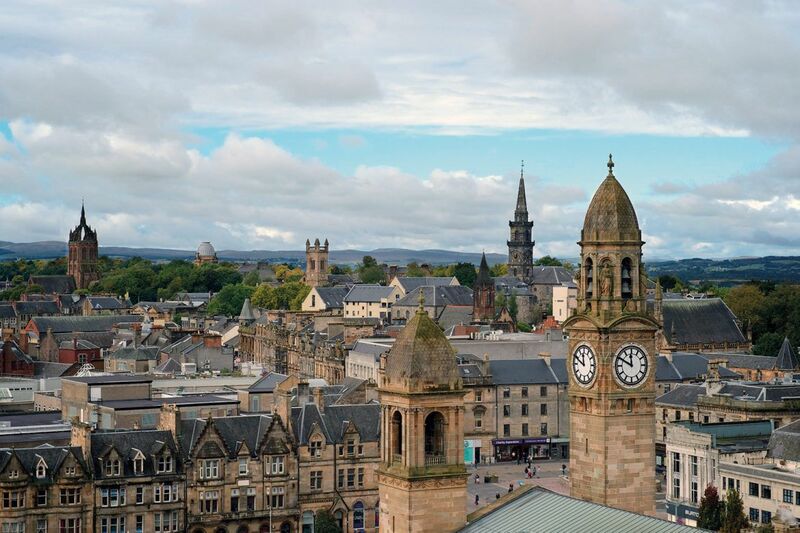 He had returned to his home town after working for four years in America following a four year apprenticeship with John Hutchison in Glasgow. His first notable building was the rather plain Gothic Greenlaw Church (. With the collaboration of William Kerr of Houston between 1890 and 1903, designs flowed from the practice for buildings in a variety of styles, usually carried out with great confidence and panache. Scots Baronial, Arts and Crafts, and Renaissance, with Art Nouveau influences developed into a Free Style, drawing on various historical styles. The practice’s most substantial commission was the Royal Alexandra Infirmary (1894-1901). Some later suburban house commissions were in an English Arts and Crafts idiom. TG was a sociable man, and keen supporter of rugby, golf and the Boys Brigade. At the age of 60, he made James Steel Maitland a partner, who continued the practice after TG’s unexpected death only four years later. Swaggering Scots Renaissance in polychrome sandstone with Art Nouveau bellcote. Asymmetrical Scots Renaissance full of inventive formal combinations. (Former Technical College) Competition-winning Free Renaissance palazzo, with swept eaves and finials giving lighter touch. Beaux Arts with corner dome and giant pilasters. Perpendicular Gothic, calm and powerful, one of TG’s best works. Beaux Arts with sweeping steps inserted between Honeyman’s sculpture and picture galleries, gracefully resolving the awkward change of direction. The son of a Paisley manufacturer, WD McLennan was educated locally, and was probably apprenticed to Peter Caldwell. Although little travelled, he emerged as one of Scotland’s most original architects active around the turn of the century. His small output is all in Renfrewshire, but includes the country’s best Art Nouveau pub interior, and a church which bears comparison with CR Mackintosh’s Queen Cross church. His five villas in Thornly Park (1899-1910) are in a free and fantastical English Arts and Crafts half timbered idiom. However his Crosslee Mill (1916, demolished) rationally expressed the building’s concrete structure, and justifies him calling himself an engineer as well as architect. Curious close entry upsets symmetry of this quirky 4 storey red sandstone tenement. Art Nouveau Goth with steeply pitched porch roofs flanking great north window. Restlessly asymmetrical Free Style tenement with witches hat roof. Inside Art Nouveau pub with cosy snugs. McLennan’s masterwork, Art Nouveau version of perpendicular Gothic with stunning interiors. The son of an Argyll grocer, JS Maitland was apprenticed at 14 to William Leiper and attended the Glasgow School of Art, where painting was his first love. He qualified as an architect in the Beaux Arts tradition in1908 and emigrated to Canada. Working for Brown and Vallance in Montreal, he designed three accomplished multi-storey commercial buildings. He returned to Britain to serve as a pilot in the Great War, and settled in Paisley, his mother’s home town, in 1919 supporting his young family by manufacturing wooden toys. TG Abercrombie took him on in 1921, immediately recognising his abilities by giving him the plum job of the Russell Institute. Maitland continued the practice after Abercrombie’s death in 1926 until retiring in 1963 at the age of 76. The large public housing estates he laid out for Renfrew Burgh from 1931 are among the best in Scotland. The one, two and three storey blocks freely blend Art Deco and Scottish Arts and Crafts elements, and the Beaux Arts layouts of squares, streets and alleys giving each area identity within unified structures. Monumental Beaux Arts children’s health centre, rich with bronze sculptures by Archibald Dawson. Stone clad reinforced concrete. Visitors welcome to view marble clad memorial hall and flying staircases. Handsome facade with bronze framed canted windows and the architect’s lion head signature. Emphatically horizontal Art Deco office facade above shops. Shops, offices and flats with elegant Art Deco corner.